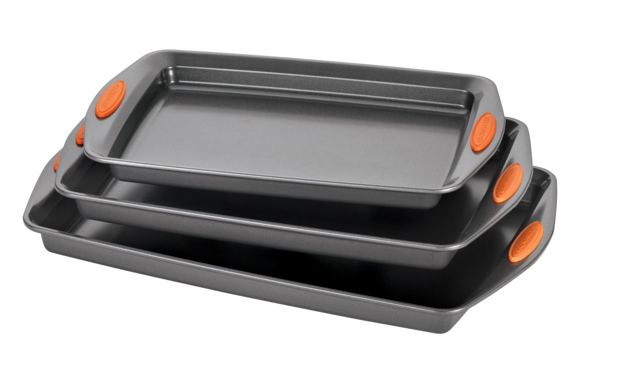 Rachael Ray Oven Lovin' Nonstick Bakeware 3-Piece Baking and Cookie Pan Set Only $29.95 (WAS $60)! You are here: Home / Great Deals / Amazon Deals / Rachael Ray Oven Lovin’ Nonstick Bakeware 3-Piece Baking and Cookie Pan Set Only $29.95 (WAS $60)! Rachael Ray Oven Lovin’ Nonstick Bakeware 3-Piece Baking and Cookie Pan Set Only $29.95 (WAS $60)! I have this set and LOVE it! Hurry and grab this Rachael Ray Oven Lovin’ Nonstick Bakeware 3-Piece Baking and Cookie Pan Set for only $29.95 (WAS $60) right now!